So, I know it’s a little early to be thinking about the holidays coming up–after all, I just hung my Halloween decorations. But, as I was searching for something quick and fun to offer as a class in November, I came across some leftover Noro Silk Garden Sock in my stash (I used the rest to make my Circles Scarf). And then it came to me that I could follow the bird portion of my Birdie Mobile pattern from Little Crochet to make cute little bird ornaments. I love it when I don’t even have to write a new pattern to make something different! I hooked up two little birdies in under two hours (including weaving in the ends). I spritzed them to straighten them out a bit and left them to dry overnight. When I woke up, it hit me that the birds needed tassels. 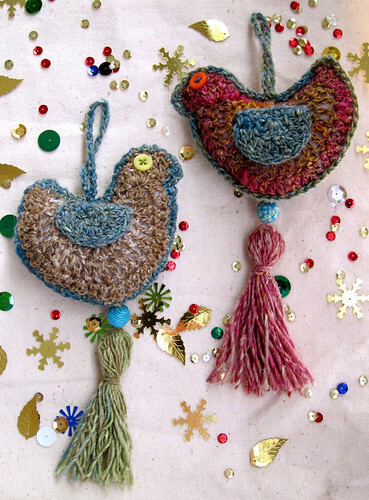 In a frenzy–because, it was completely necessary to finish these before I went to work–I ransacked my bead drawer and found some random beads, which I strung on a finger-wrapped tassel and attached to the bird. (I still made it to work on time, thanks for asking.). The only other modification that I made to the pattern was to use a D- 3.25 mm hook (with sock weight yarn) and add a 22 chain loop in the center back of the bird for hanging, and I added button eyes, which are easiest to sew on before you crochet the birdies together. I came home from work and made another birdie…and there are more in my future. 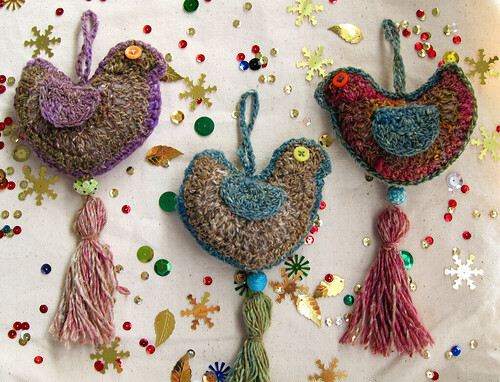 I’m teaching the Bird Ornaments as a class at Yarnivore in November (on Sunday, the 20th, from 1-3 PM) for locals–it’s only $15 + materials to sign up. But even if you aren’t nearby, I’d love to see your variations on these ornaments on Ravelry. I think they would be cute to top off a gift, and my sis has already requested one for her ornament exchange party. 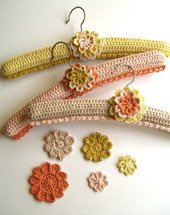 Personally, I’ll probably use them to decorate all year–they look great hanging from my kitchen cabinet knobs. And of course, you can experiment with any size yarn scraps or go for more traditional holiday colors. I’d guess that one ball of Noro Silk Garden Sock would make around 8 to 10 birds, tassels included. My finished ornaments measure about 3 1/2″ wide, the ones in the pattern–worked in worsted weight–measure 4 1/2″ wide. Have fun, and remember–it’s never too early to get started!